A thief sneaks off with five out of seven swords. It's no surprise that when it comes to swords, attacks are sneaky and tricky, not direct like with Wands. Yet this is still an attack that requires creativity and steadfastness. 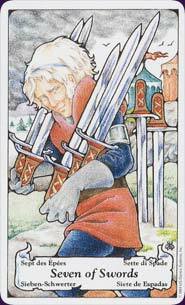 The image also us back to number five (stolen swords) and "loss" along with what remains behind, number two, and choices. This is the "Thief" card, and though it can be taken literally (protect yourself against theft), it usually means a different type of stealing. Being the intellect and communication, what might be stolen are ideas, something you've written, or even an internet password. The querent should be warned to be on their guard, especially against those who are trying to extract information from them. Stand guard over what you value, and try to outwit the thief. In some cases, in fact, this card might be advising the querent that they have to be the thief. They need to be tricky, sneaky, even dishonest because, in some situations, honesty is not the best policy. Sometimes flattery, lies, dissembling is necessary to get back what you feel belongs to you. Learn the Seven of Swords tarot card meaning and the rest of the card meanings, symbols and stories in our eBook.